Highlighting the the unending suffering of the family members of the road accident victims, speakers at the inaugural of the 30th Road Safety Week here on Monday, appealed to the drivers to ensure their safety and the passengers while behind the wheels. Accident deaths leave a void in the family members of the victims that can’t be filled in a lifetime. Drivers should bear this in mind all the time, they said. RTC drivers need to be extra careful as minor errors in judgement such as brushing against a two-wheeler could prove fatal to the rider. 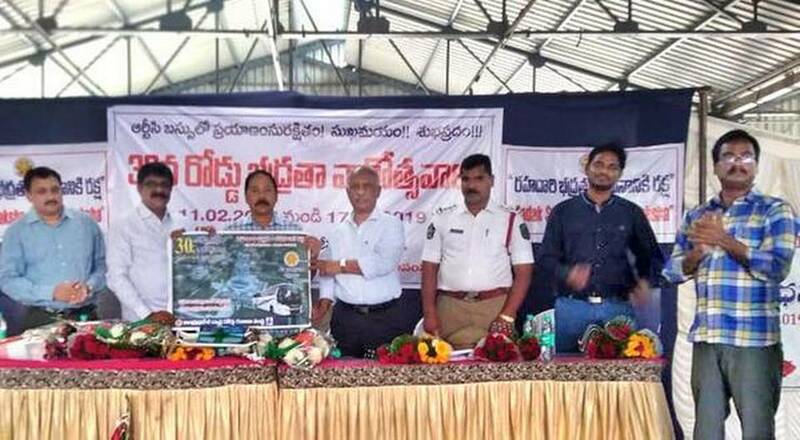 “Death of the breadwinner could emotionally and financially cripple the family members, apart from causing distress in the family of the driver involved in the accident,” they told to a large gathering of RTC drivers at the programme organised by the APSRTC. Participating as the chief guest, Deputy Transport Commissioner S. Venkateswara Rao advised the RTC drivers to keep their family photo in their pocket while on duty, saying that it would be a constant reminder to them that there was someone waiting for their safe return. “Even as the RTC is transporting lakhs of people daily to their destinations, a few accidents are enough to dent the image of the corporation as a safe public transport agency. The RTC management must ensure that drivers are given adequate rest,” he said. RTC Executive Director (Vizianagaram Zone) P.V. Rama Rao said that the role of drivers was most vital in ensuring safety on the roads. He reminded the drivers of various initiatives being undertaken for the welfare of drivers and other employees. RTC Regional Manager G. Sudesh Kumar, PCRA Deputy Director Srinivas and Circle Inspector Simhachalam spoke on the occasion.